It is hard to defy the passing of time, so at one moment we will need the help of advanced medical care to restore and rejuvenate our skin. Of course, the use of dermal fillers is nothing too complicated, the single thing that is sophisticated about them is the content of the fillers. They can be made out of various substances, like hyaluronic acid (HA), also known as Restylane/ Juvederm or Poly L lactic acid, known as Sculptra. The purpose of these substances, after being introduced under our skin, is to fill wrinkles and offer a plumber and more youthful look. 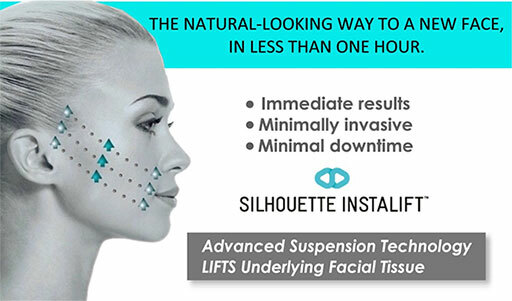 No wonder facial fillers became such a popular way of reversing time and to give a more youthful appearance. 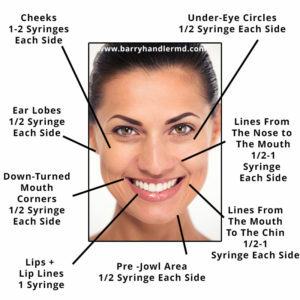 Juvederm and Restylane products are the most well known HA however there are other dermal fillers as well, which work just as efficiently but less known by most people. How much HA filler is needed on each part of the face? Here is an example of how much fillers are needed to fill and repair certain area. Keep in mind fillers need to be retouch on a regular basis as the aging process continue to breakdown collagen in the skin which are then replenish by fillers. Cheeks – Voluma or Restylane Lyft. Voluma is hardier and may last longer than Lyft therefore it is more expensive. Lips – Juvederm Ultra Plus give a smooth result with longer lasting results than Regular Juvederm. Smokers lines – Restylane Silk for smooth filling of the lines above the lip without excessive thickness. It is also great for outlining lip borders and rebuilding philtrum column. It can also be use to soften crow’s feet. 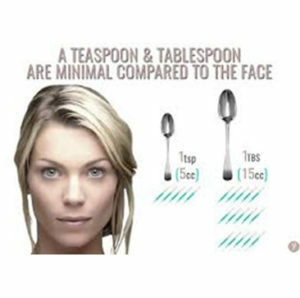 Furthermore a syringe is equal to 1 ml or 1/5 of a teaspoon hence multiple syringes are usually needed to volumize the face to a desired level. Sculptra is another type of filler that contain microspheres of synthetic poly L lactic acid. What people don’t know is that Sculptra, in comparison with hyaluronic acid, works great in the case of bigger fills or larger area. Sculptra act by seeding the skin so your own collagen starts to grow and multiply. Of course, the younger you are the more collagen can be produce. 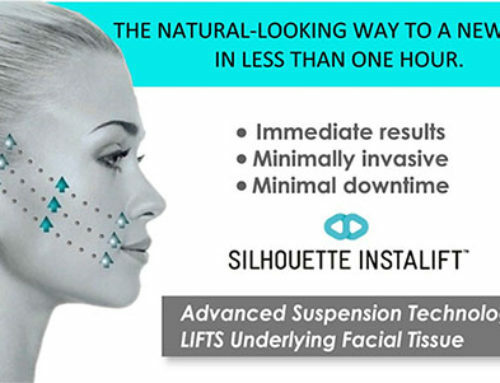 Sculptra helps to support the rejuvenation process by increasing your own collagen production in the skin therefore the effect is not immediate so one has to be patient as it is a gradual process that will slowly transform your face. 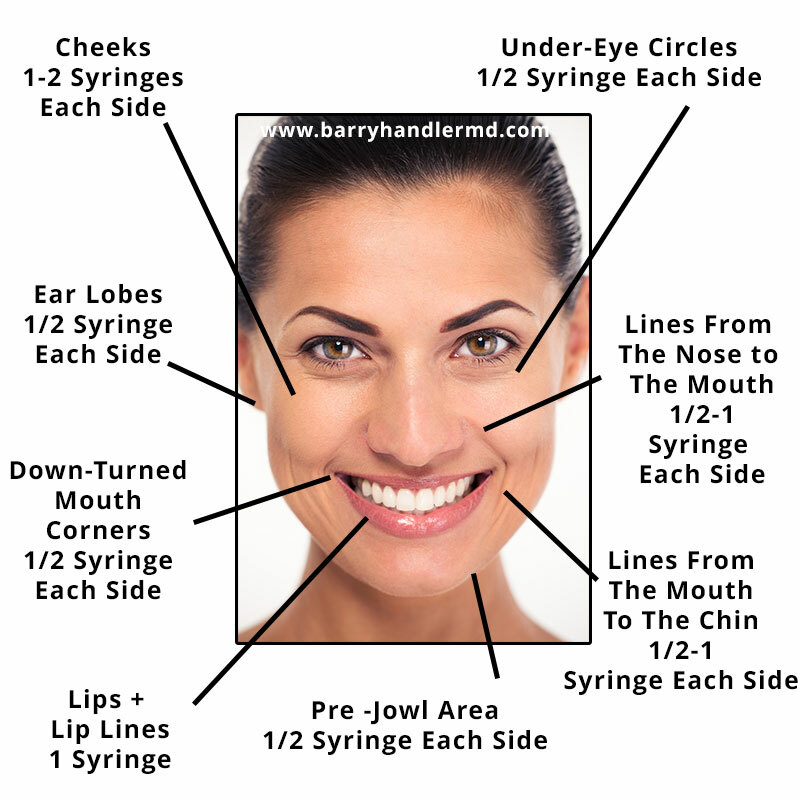 For best results, you can combine Sculptra with the HA fillers such as Restylane or Juvederm line of products. By volumizing the perimeter of the face with Sculptra along with HA fillers in the cheek areas, the fold around nose and mouth are reduced and lifted. If you have an event coming soon, Restylane or Juvederm can provide an immediate plump appearance of the injected area so you can use them until Sculptra manages to kick in properly. It is best to use Sculptra and HA with each other on separate occasion and in same or different areas so as to get gradual along with immediate results. Therefore it is important to get a consultation with our professional injector who can help you devise an esthetic plan based on your individual need.